Euboea or Evia (; Greek: Εύβοια, Evvoia, [ˈevia]; Ancient Greek: Εὔβοια, Eúboia, [eúboja]) is the second-largest Greek island in area and population, after Crete. The narrow Euripus Strait separates it from Boeotia in mainland Greece. In general outline it is a long and narrow island; it is about 180 kilometres (110 mi) long, and varies in breadth from 50 kilometres (31 mi) to 6 kilometres (3.7 mi). Its geographic orientation is from northwest to southeast, and it is traversed throughout its length by a mountain range, which forms part of the chain that bounds Thessaly on the east, and is continued south of Euboea in the lofty islands of Andros, Tinos and Mykonos. It forms most of the regional unit of Euboea, which also includes Skyros and a small area of the Greek mainland. Like most of the Greek islands, Euboea was originally known under other names in Antiquity, such as Macris (Μάκρις) and Doliche (Δολίχη) from its elongated shape, or Ellopia, Aonia and Abantis from the tribes inhabiting it. Its ancient and current name, Εὔβοια, derives from the words εὖ "good", and βοῦς "ox", meaning "the land of the well-fed oxen". The phrase στὸν Εὔριπον 'to Evripos', rebracketed as στὸ Νεὔριπον 'to Nevripos', became Negroponte in Italian by folk etymology, the ponte 'bridge' being interpreted as the bridge of Chalcis. That name entered common use in the West in the 13th century, with other variants being Egripons, Negripo, and Negropont. Under Ottoman rule, the island and its capital were known as Eğriboz or Ağriboz, again after the Euripos strait. Euboea was believed to have originally formed part of the mainland, and to have been separated from it by an earthquake. This is fairly probable, because it lies in the neighbourhood of a fault line, and both Thucydides and Strabo write that the northern part of the island had been shaken at different periods. In the neighbourhood of Chalcis, both to the north and the south, the bays are so confined as to make plausible the story of Agamemnon's fleet having been detained there by contrary winds. At Chalcis itself, where the strait is narrowest at only 40 m, it is called the Euripus Strait. The extraordinary changes of tide that take place in this passage have been a subject of note since classical times. At one moment the current runs like a river in one direction, and shortly afterwards with equal velocity in the other. A bridge was first constructed here in the twenty-first year of the Peloponnesian War (410 BC). Geography and nature divide the island itself into three distinct parts: the fertile and forested north, the mountainous centre, with agriculture limited to the coastal valleys, and the barren south. 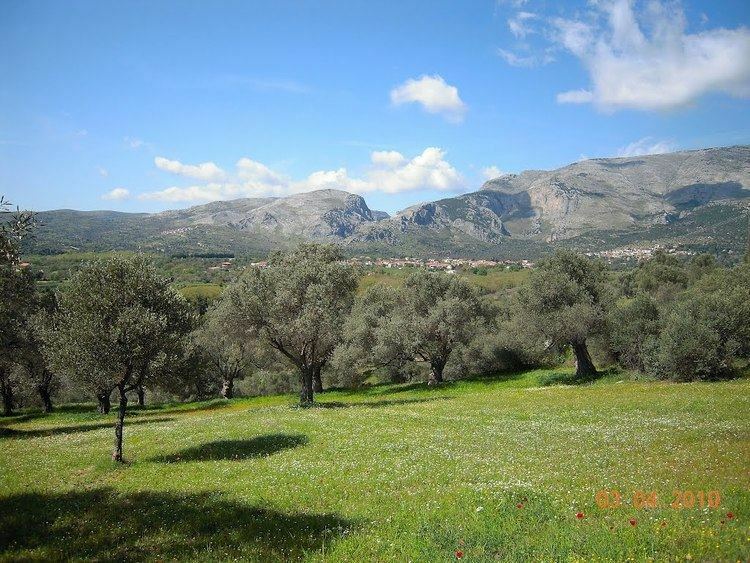 The main mountains include Dirfi (1,743 m (5,719 ft)), Pyxaria (1,341 m (4,400 ft)) in the northeast and Ochi (1,394 m (4,573 ft)). The neighboring gulfs are the Pagasetic Gulf in the north, Malian Gulf, North Euboean Gulf in the west, the Euboic Sea and the Petalion Gulf. At the 2001 census the island had a population of 198,130, and a total land area of 3,684 square kilometres (1,422 sq mi). The history of the island of Euboea is largely that of its two principal cities, Chalcis and Eretria, both mentioned in the Catalogue of Ships. Both cities were settled by Ionian Greeks from Attica, and would eventually settle numerous colonies in Magna Graecia and Sicily, such as Cumae and Rhegium, and on the coast of Macedonia. This opened new trade routes to the Greeks, and extended the reach of western civilization. The commercial influence of these city-states is evident in the fact that the Euboic scale of weights and measures was used among the Ionic cities generally, and in Athens until the end of the 7th century BC, during the time of Solon. The classicist Barry B. Powell has proposed that Euboea may have been where the Greek alphabet was first employed, c. 775-750 BC, and that Homer may have spent part of his life on the island. Chalcis and Eretria were rival cities, and appear to have been equally powerful for a while. One of the earliest major military conflicts in Greek history took place between them, known as the Lelantine War, in which many other Greek city-states also took part. Following the infamous battles of Thermopylae and Artemisium, Persian forces captured and sacked Athens, and also took Euboea, Boeotia, and Attica, allowing them to overrun almost all of Greece. In 490 BC, Eretria was utterly ruined and its inhabitants were transported to Persia. Though it was restored nearby its original site after the Battle of Marathon, the city never regained its former eminence. By 410 BC, the island succeeded in regaining its independence. Euboea participated in Greek affairs until falling under the control of Philip II of Macedon after the Battle of Chaeronea in 338 BC, and eventually being incorporated into the Roman Republic in the second century BC. Aristotle died on the island in 322 BC soon after fleeing Athens for his mother's family estate in Chalcis. From the early Hellenistic period to well into the Roman Imperial period, the island was organized into the Euboean League. Based on the records of the 2nd century AD geographer Pausanias, it is suspected that the Titan god Crius is an indigenous deity. Due to its relatively isolated location, Euboea was spared the bulk of the barbarian raids during Late Antiquity and the early medieval period. The Vandals raided its shores in 466 and in 475, but the island seems to have been left alone by the Avars and Slavs, and it was not until a failed Arab attack on Chalcis in the 870s that the island again came under threat. As a result, the island preserved a relative prosperity throughout the early medieval period, as attested by finds of mosaics, churches and sculpture throughout the 7th century, "even from remote areas of the island". In the 6th century, the Synecdemus listed four cities on the island, Aidipsos, Chalcis, Porthmos (modern Aliveri) and Karystos, and a number of other sites are known as bishoprics in the subsequent centuries (Oreoi and Avlon), although their urban character is unclear. In the 8th century, Euboea formed a distinct fiscal district (dioikesis), and then formed part of the theme of Hellas. In 1157 all the coastal towns of Euboea were destroyed by a Sicilian force, while Chalcis was burned down by the Venetians in 1171. Euboea came into prominence following the Fourth Crusade. In the partition of the Byzantine Empire by the crusaders after 1204, the island was occupied by a number of Lombard families, who divided it into three (later six) baronies. The island's rulers came early on under the influence of the Venetian Republic, which secured control of the island's commerce in the War of the Euboeote Succession and gradually expanded its control, until they acquired full sovereignty by 1390. On 12 July 1470, during the Ottoman–Venetian War of 1463–1479 and after a protracted and bloody siege, the well-fortified city of Negroponte (Chalcis) was wrested from Venice by Mehmed II and the whole island fell into the hands of the Ottoman Empire. Although the name Negroponte remained current in European languages until the 19th century, the Turks themselves called the city and the island Eğriboz or Ağriboz after the Euripos Strait. Under Ottoman rule, Ağriboz was the seat of a sanjak encompassing much of Continental Greece as well. At the conclusion of the Greek War of Independence in 1830, the island constituted a part of the newly established independent Greek kingdom. Euboea is linked to the mainland by two bridges, one that runs through Chalkis and is also accessible from Thebes, and another which bypasses Chalcis and is accessed from Athens. All of Euboea's modern bridges are suspended. In the 1980s, the Dystos lake was filled with grass which was set on fire by farmers to make more farmland. This act caused devastation of much of the plants and the environment in that area. A part of the lake later regenerated. Also the municipalities of Anthidona and Avlida in the mid to late 20th century, which once were part of Boeotia, reverted to Chalkis. Since then, the postal codes corresponded with the rest of Euboea, including Skyros. The population of the island according to the census of 2001 was 198,130, making it the second most populous island of Greece. As a whole the Euboeans share a cultural identity similar to that of the people in the rest of Central Greece and they speak a southern variety of Greek. In the southern part of the island there are Arvanite communities, with the area south of Aliveri being the northernmost limit of their presence in Euboea. Sarakatsani and Vlachs could be found mainly in the mountainous areas in central and northern Euboea respectively, but nowadays they have abandoned the nomadic way of life and live permanently in the towns and villages across the island. The mining areas include magnesite in Mantoudi and Limni, lignite in Aliveri and iron and nickel from Dirfys. Marble is mined 3 km (2 mi) north of Eretria which include Marmor Chalcidicum and asbestos in the northeastern part of Carystus in the Okhi mountain. The trees include chestnuts. Greek National Road 77 NW, N, W, Cen. 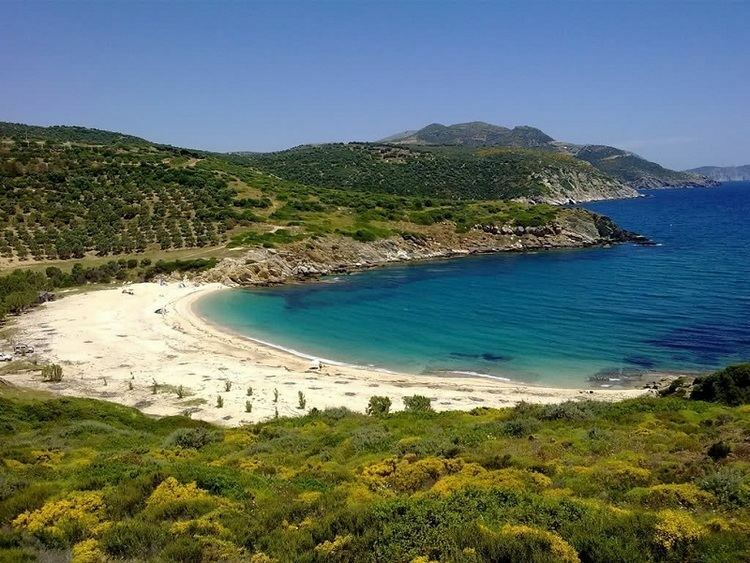 The island belongs to Euboea Prefecture which also includes two municipalities on the mainland, Anthidona and Avlida, as well as the island municipality of Skyros. At the 2001 census the prefecture had a population of 215,136 inhabitants, whereas the island itself had a population of 198,130. The prefecture's land area is 4,167.449 km2 (65 sq mi), whereas the total land area of the municipalities actually on the island is 3,684.848 km2 (264 sq mi), which includes that of numerous small offshore islets (Petalioi) near Euboea's southeastern tip.